It seems everywhere I turned this week, someone was announcing the arrival of Transition. On Friday we passed the autumnal Equinox when the sun appears to cross the equator from north to south heralding the first day of fall. Even in Texas, recent days have brought a palpable change in the temperature and the quality of light. At these times of seasonal transition, the buzz is that we are experiencing a moment of shift, a time-sensitive opportunity to let go and to prepare for the next season of our life – out with the old and in with the new. I’m the Transition poster child, here in my new hometown with my new nephew, building a new house and a new private practice – I’m even physically in transit as I type this, writing from 30,000 feet in the air. And in truth, it seems everyone I know is in the midst of some fairly large transitional turbulence – a new marriage, a new job, a major remodel, a father’s death, an imminent relocation. Either I’m hanging out with a self-selecting crowd of transitioners, or there is a larger trend at work here. Being in transition seems to be the new black. The implication of all this transition talk is that it’s somehow contained: we’re passing through a discreet blip on the calendar, an unsettled moment sandwiched between some larger, more serene moments. Pretty soon, we’ll get through it and be on the other side. We’ll be in the MIDDLE of autumn, in the full swing of the school year, firmly established in the second year of home-ownership. Things are gonna settle down. Any minute now. What struck me today is that this sense of turbulence isn’t remotely unique to this spot on the calendar. The transitions just keep coming. There isn’t a period up ahead when life promises to stop delivering tectonic shifts. While I have caught myself blaming this condition on our modern lifestyle (“…we’re so addicted to speed and excess information and multitasking and hasty decisions prompted by marketing campaigns, no one makes time for stillness any more…”), in reality, it’s a fact of the human experience, just part of the package. The ancient Buddhist teachings on impermanence underline the ever-present nature of change. The only constant really IS change, and that was true even back when Heraclitus first said it in the 5th century B.C. As common as it is, that doesn’t diminish how uncomfortable it feels (to most of us) to be in transition for long. According to Ayurveda, as I wrote in my last post, transitions (even “good” ones) aggravate vata dosha, which can lead to a variety of discomforts like stress headaches, constipation, joint pain, indigestion, feeling off-center, ungrounded or outright panic-stricken. Teaching us how to pacify vata is one of the great gifts of Ayurveda as a health system, helping us to tolerate the turbulence of life’s passage with greater ease. Stick to my routines – to the extent possible, get up at the same time, eat at the same time, do my morning routine as usual. Ask myself regularly, “Am I thirsty?” and then drink something, preferably something warm. At the very least, avoid ice. Stay warm. Keep a scarf in the car. Cover my head, and ears in particular, when it’s windy out. For God’s sake, don’t stop abhyanga (applying oil to the skin before showering) – this is an easy one to let drop by the wayside while traveling or feeling time-deprived, and all the more potent at those times. Create some mental stillness. People-watch instead of trying to accomplish something during my connection. Close my eyes and breathe. Look out the window and daydream. Think of something I’m grateful for, and then tell the responsible people. Dwelling in gratitude is the best anti-anxiety medicine there is. 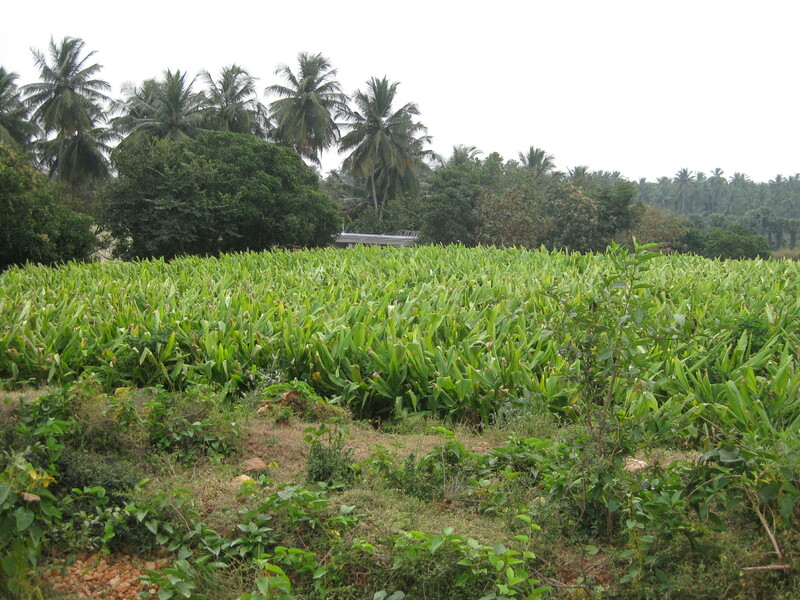 After three and a half weeks away, I returned to Vaidyagrama on Tuesday night. As I had hoped, it felt like a sweet homecoming. Returning as a patient now with all of our classes and travel completed, I have a very different mindset, focused on rest, integration and rejuvenation. I can feel my mind and body heaving something like a sigh of relief. While my travels of the past three weeks (and indeed, the past five months) have been entirely smooth and fascinating, inspiring even, it was still a great relief and joy to arrive at the Coimbatore train station and see Ramaswamy, our familiar taxi driver, waiting for me after my ten hour train ride from Trivandrum – but I’m getting ahead of myself. After my weeks of silence here in blogland, I have some catching up to do. 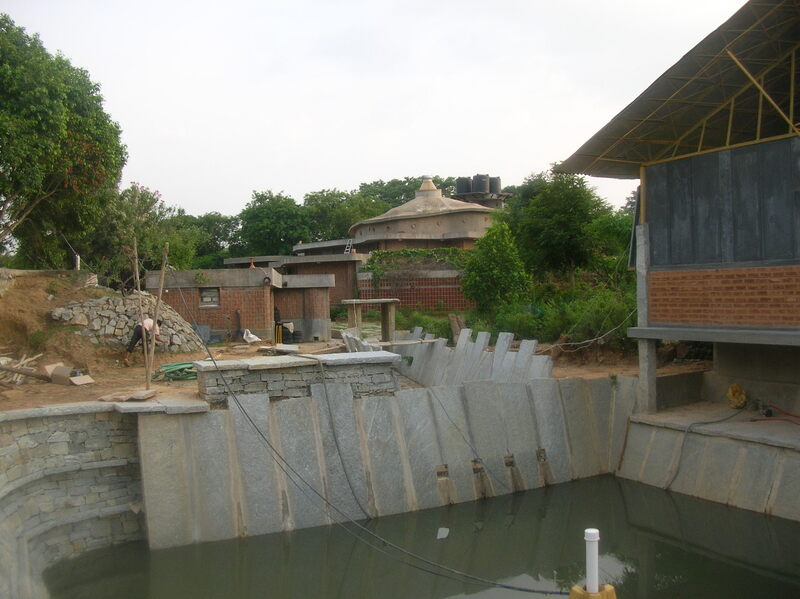 The Magic House (in the background) as viewed across the future fish pond next to the ayurvedic center currently under construction. Aside from housing and feeding us (exceedingly well), she gave us an entire weekend workshop on vision, values, leadership and self-evaluation. We stayed in their lovely and incredibly unusual home (called “the Magic house” by their neighbors, and it wasn’t hard to see why…. 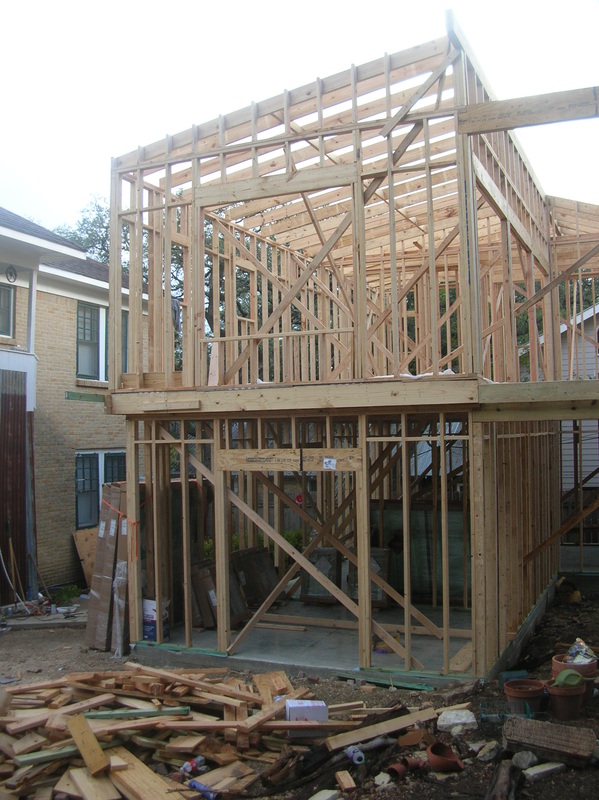 Among other novelties of construction, they are building an ayurvedic treatment center in their back yard, literally. Unexpected things are possible around these folks). We also visited the Hanuman temple that their family helps support. Hanuman, the strong and fearless monkey god who exemplifies the ideals of service and devotion, is a fitting symbol for this amazing family, and we felt blessed to be included in their circle for a time. 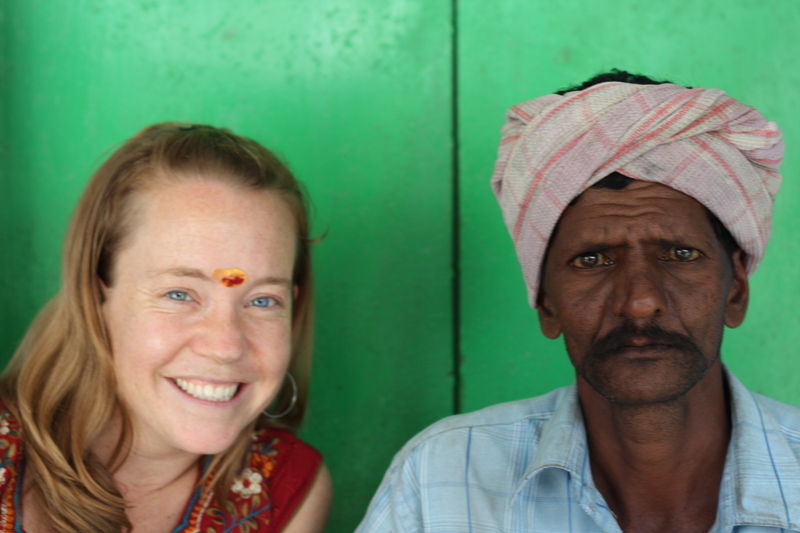 From Bangalore, Emily and I left the others and set off on our own. Our plan was loose, with the intention merely of moving where the path seemed least cumbersome. Since we had only one fixed point in our travel schedule (to meet up with Dr. Ramdas and his family for a festival in his hometown) and many interesting destination options, we developed a strategy in our itinerary-planning: to trust India’s signals in the form of ease of transit, looking for the simplest path to an endpoint; the moment we hit any resistance in our planning, like overbooked trains or a lack of convenient routes to a possible destination, we took that as a sign to try a different destination altogether rather than forcing something to fit. It has been a great lesson in remaining unattached and seeking the flow of momentum – a great strategy for calming vata dosha too, which is generally agitated by travel anyway. We ended up taking a night train from Bangalore to Fort Kochi on the coast and settling in there for a full week. 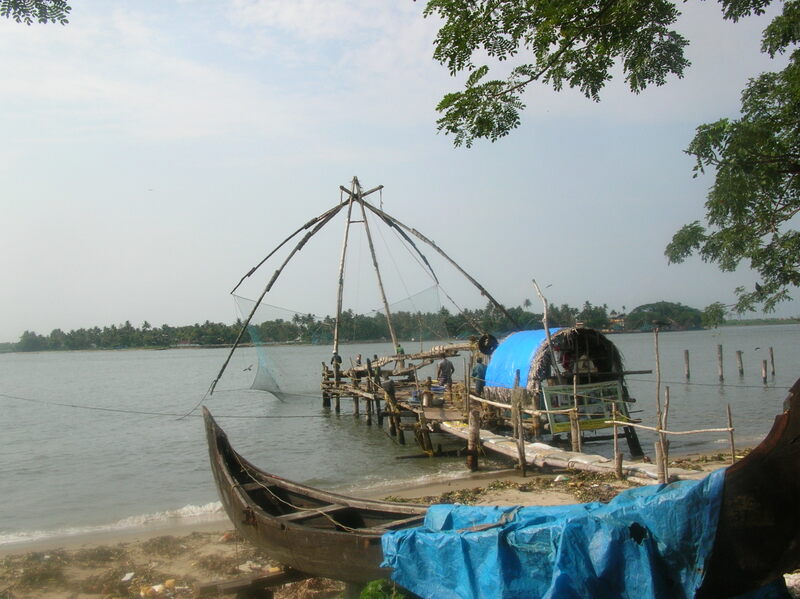 While it is a tourist Mecca in the high season, during the summer Fort Kochi is rather bereft of foreign visitors. There were a fair number of Indian tourists, but even as newcomers to town we could feel the lack of crowds in the shops and restaurants, the sheer number of which served as a sign of the potential for tourists – and we were grateful for our timing. Although it was indeed HOT, we were actually happy to trade the cooler temperatures of the high season for the lack of crowds and other foreigners (who we tend to think give us a bad name, ideal tourists that we are!). To reach the town of Fort Kochi from the train station, we took a small ferry befitting a town that makes its living off of the sea. 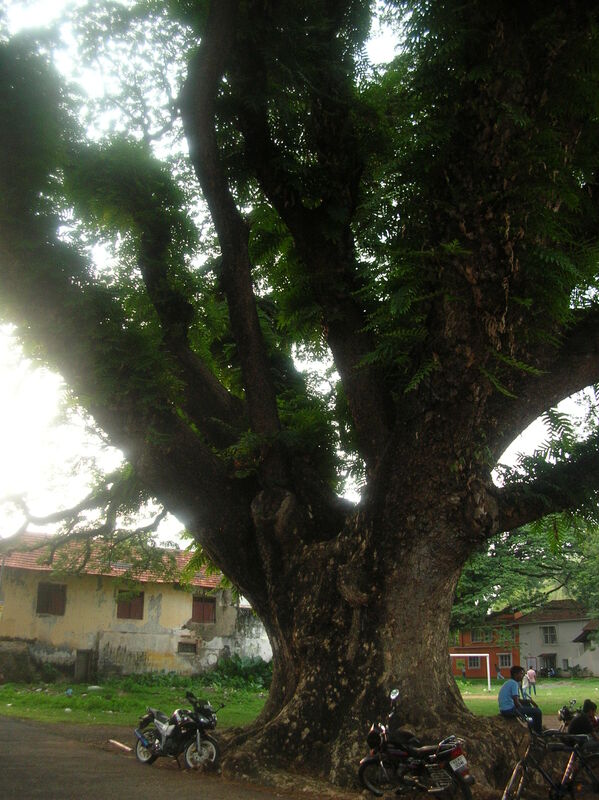 Fort Kochi shows evidence of the varied cultures that have settled here in an attempt to control its lucrative port and its place in the spice trade. As one guide book describes it, “During a wander through Fort Kochi’s narrow lanes, you will stumble upon spice markets, Chinese fishing nets, a synagogue, a Portuguese palace, India’s first European church, Dutch homes, and a village green that could have been transported from England’s Home Counties.” The Dutch Palace houses some beautiful murals painted with vegetable paints in a traditional native style, depicting Hindu gods and stories. 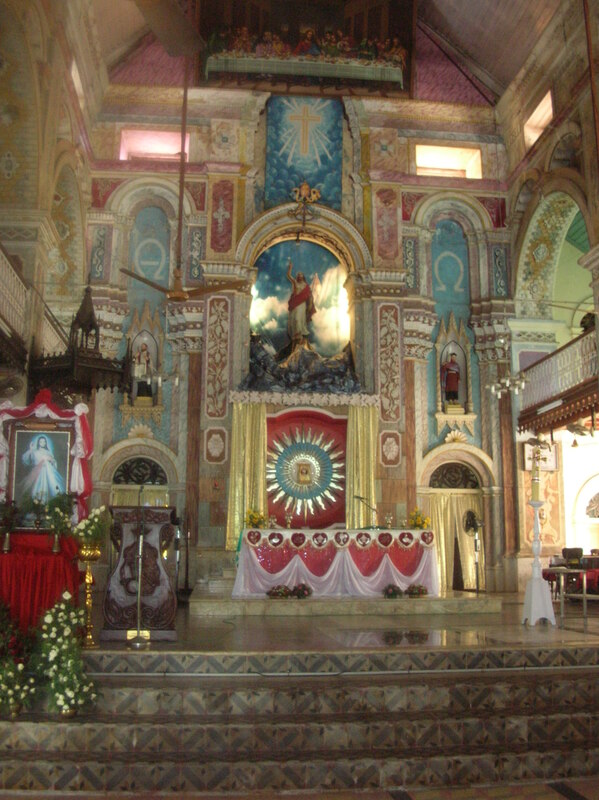 Fort Kochi is also home to one of the only communities of Jews in India. The rare synagogue there is still functioning but apparently only has about 12 members in the congregation now, all elderly. The center of town is a cluster of shops and old buildings snuggled against a small beach, surrounded by massive towering trees. It feels a bit like the ante-bellum south of the United States, with a similar sense of dated gentility and a slow pace of living. The beachfront is adjacent to the functioning Chinese fishing nets, elaborate contraptions that look like kites made of gossamer, which are lowered into the water and after some time are raised back up, full of glittering bounty. There were many churches and cathedrals even, signs of the Portuguese Catholic influence. In the evening at sunset, Emily and I walked along the beachfront amidst the Indian tourists, eating ice cream or drinking chai, and watched the waves crashing and the Indians wading. 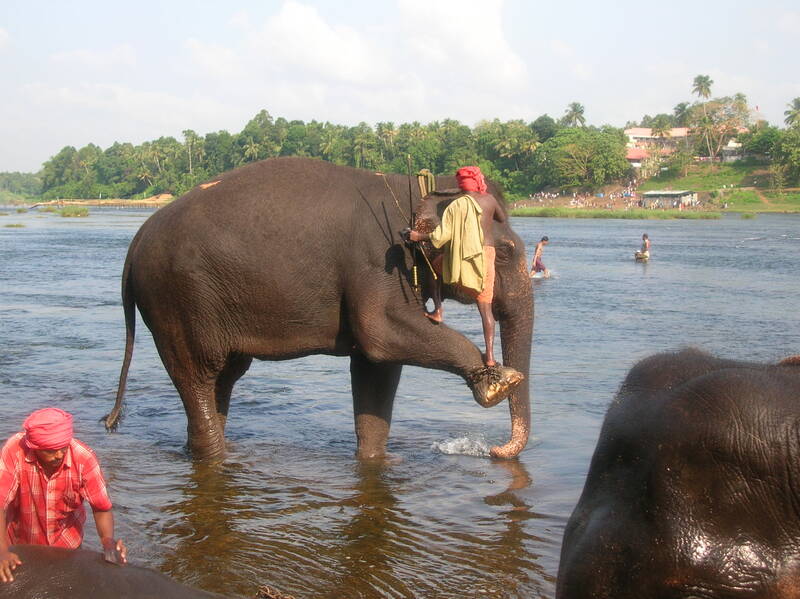 Most Indians do not swim, even those living in Kerala, the most beautiful coastal state you can imagine. No one has given us a compelling explanation for why not. We were ready to dive in, were it not for the stares we were already attracting by simply walking on the shore. Some people stopped us and asked where we were from, while others just smiled or giggled – we have learned to see giggling as a complimentary gesture, not laughing at us (we hope) as much as laughing out of happiness or surprise, perhaps colored by shyness or not knowing how to approach us. Once in a grocery store here in Coimbatore as a clerk was showing me to the fruit aisle, she asked where I was from and then after a few more steps in grinning silence, she simply said, “I am so happy!” It’s humbling to have people so very happy at your mere presence. 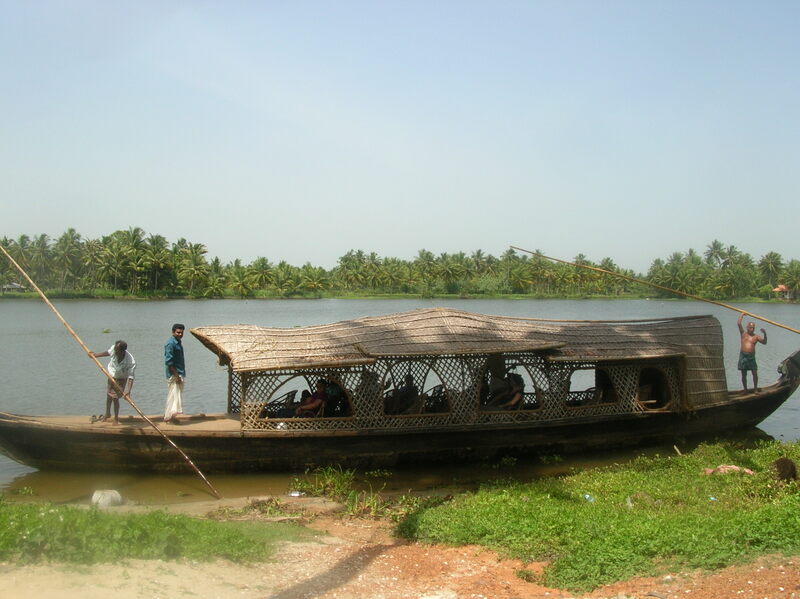 One day, we took a day trip from Fort Kochi into the backwaters of Kerala on a beautiful rattan boat. Powered by two men with poles, the speed was leisurely and entirely relaxing. We traveled along canals through residential communities, enjoying the breeze and the views. After lunch, we got in smaller boats, more like a wide canoe, and poled along smaller waterways back into neighborhoods. It felt rather like a tropical, rural Venice. We witnessed the exception to the “Indians don’t swim” rule as children cavorted in the deeper canals. 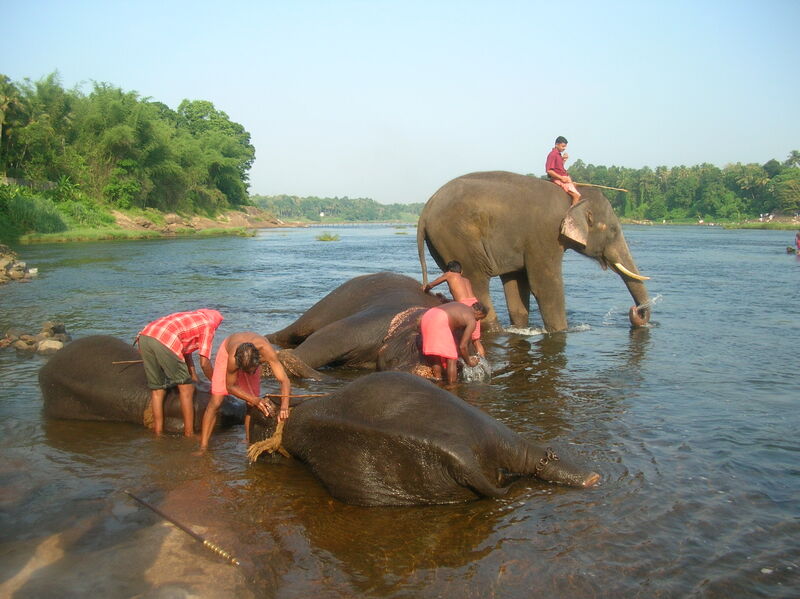 On another day, we visited an elephant training camp where they bathe the elephants in a nearby river. 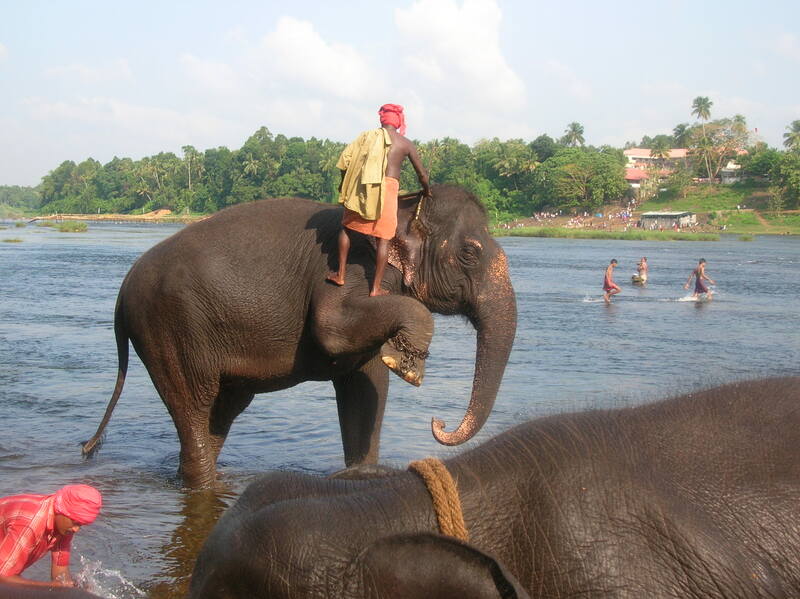 They led the elephants (five of them in all) to the water’s edge and instructed them to lie down and then scrubbed them with coconut hulls. A crowd of about thirty tourists had gathered on the banks with our cameras, transported from town with similar promises of possibly getting to help bathe them. After the team of trainers had been at it for about five minutes and we were beginning to wonder how to work our way in, one of them looked up and waved me over to help, and I waded in up to my knees and he handed me a coconut hull. When they are lying down, elephants are much less formidable and statuesque, far less likely to step on you (although rolling over you is still a distinct possibility). When they stood back up, they somehow remained approachable, as we had shared this intimate moment with them at their morning toilette. Emily and I prayed that they were happy elephants. Even in this land that reveres their elephants, seeing such monumental wild beasts in captivity made us cringe a bit. Anthropomorphizing is far too easy, with their sweet eyes and apparent cooperation with their trainers. 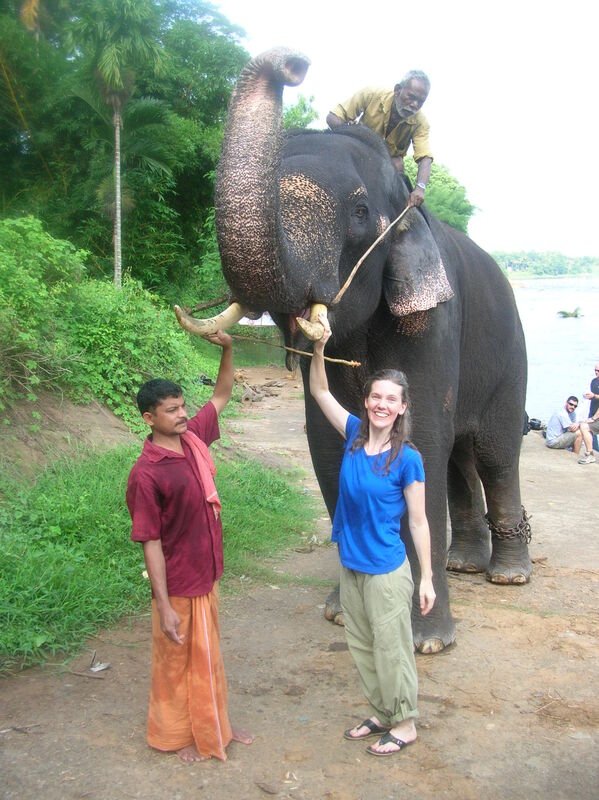 It was the perfect preview for Pooram, the elephant festival that we headed to next, but that will have to wait for another day’s post as I am now being called for my treatment. More to come soon….! 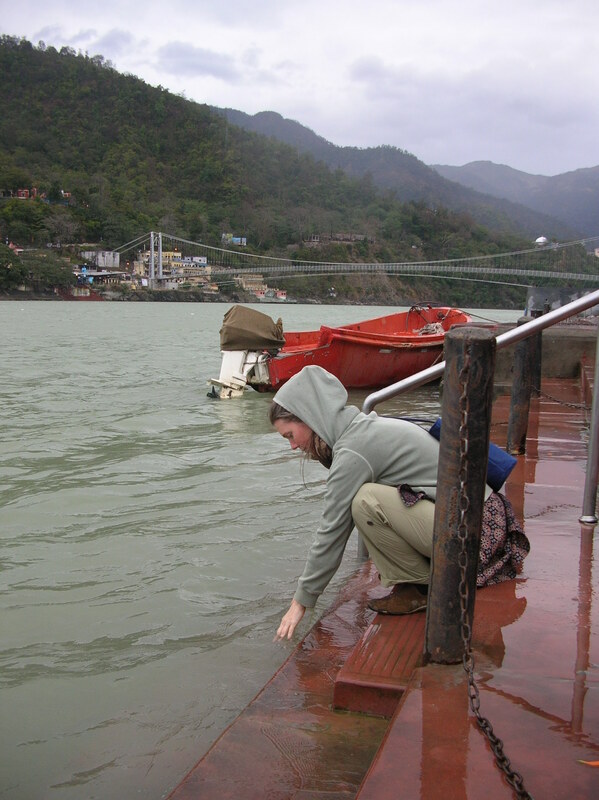 We arrived in Rishikesh in the middle of the night in a howling rain storm after a full day of travel. Blessedly all of our travel details had been arranged for us by the Punarnava staff, including a friendly driver named Sunny who picked us up at the New Delhi airport and transported us in style the 7 hours to Rishikesh. His minivan was outfitted with understated beige and tan tassels around the sun visors that wiggled in unison with every bump, as well as a dashboard shrine to his guru (which we discovered lights up at night) and electric blue interior lights (which he turned on when we pulled in to a restaurant or any other stop that might provide an audience). When we finally arrived in Rishikesh, and he dropped us at one end of a massive metal foot bridge that was suspended 100 feet above the coursing Ganga below, and we fought our way against the driving wind in the near-darkness to the ashram on the other side that was to be our home for the next ten days. Our friends from Punarnava, Aparna and Nagaraj, met us with hugs and escorted our weary bodies to our rooms. The Parmarth Niketan Ashram is charmingly worn around the edges. I don’t know when it was built, but you can imagine the myriad monks in training as well as more recent yogis and backpackers who have graced its halls. The rooms are very basic, although ours had a hot water heater in the bathroom, which was all the more welcome given that there was no heater in the room itself and it dipped well below 50 degrees Fahrenheit the first two nights. One of our favorite features at the ashram was the clock that tolled the hours – there was a bell tower next door that chimed every hour with a lovely round gonging sound, and just after that, the ashram “bell” would toll, sounding suspiciously like a man banging a large pot with a metal utensil – each night at a different speed, and not always as many times as the clock next door. Emily and I roomed together, and we would dissolve in a fit of giggles every time we heard it. Upon waking the first day, we headed out to see the town by daylight. The front gate of the ashram let out onto a main street directly in front of the Ganga, and I immediately ran down the ghats (kind of like large steps) to the water’s edge. The Ganga’s presence is massive and fresh and joyful. I can’t explain why it is so magnetic and emotionally riveting to me – putting my hands in the water instantly brought tears to my eyes. Each night, the ashram holds an aarti ceremony on the same ghats beneath an enormous statue of Shiva, with a fire ceremony and jubilant singing by the resident students of the ashram in their yellow robes. People come from all over the world and join the singing, which is amplified and carries easily over the water casting a spell over the whole town. Every night, I sat rapt watching the water and those boys, some of whom couldn’t have been older than 6 or 7, as they chanted the Hanuman Chalisa (presumably as they have done every night for years), some with their eyes closed in devotion, and I wondered what their inner lives are like. In some ways, as I’d watch two of them joke and push each other in between songs, I could have mistaken them for any boys found across the globe, and then with the next song they’d fall into introspective swaying and I’d remember that they are in training for a life so very different from anything most of us will ever know. They were captivating to watch. Meanwhile, the singing would roll onward, sometimes in the call-and-response style of kirtan, sometimes a simple singalong. 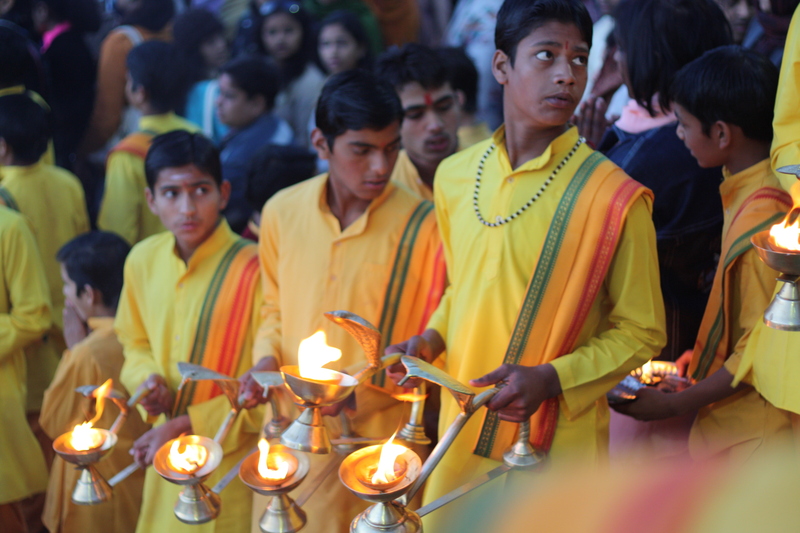 The finale of the evening was the aarti itself, honoring the river with the flames of lit camphor. Everyone would stand and face the Ganga and the ashram boys would light serpent chalices and platters and pass them among the crowd. 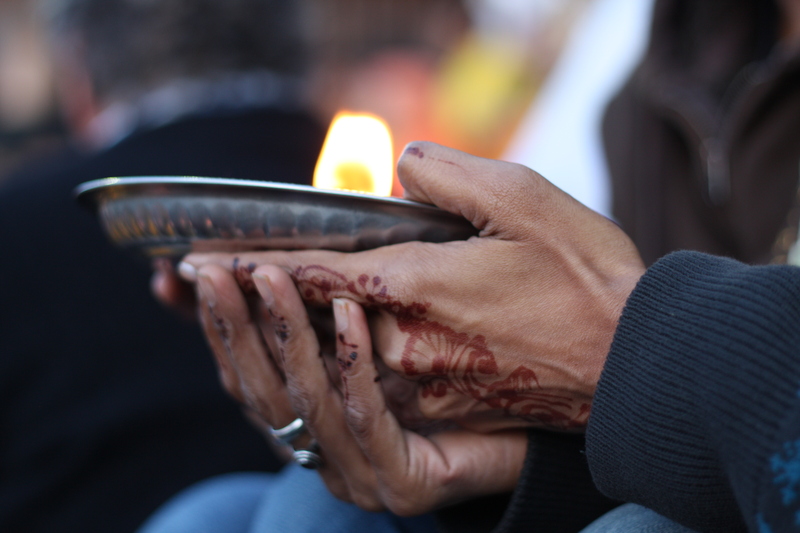 We’d all take turns placing a hand on the nearest chalice and move the flame in circles to honor and thank the river goddess with our small lights in the waning sunshine, a tiny reflection of all the goodness that Mother Ganga brings to us. Then the chalice would be passed on to the stranger next to you, who by this time is starting to feel like family. This happens every night, rain or shine, a grand display of gratitude and joy and song. It was enough to send me into tears each and every night. 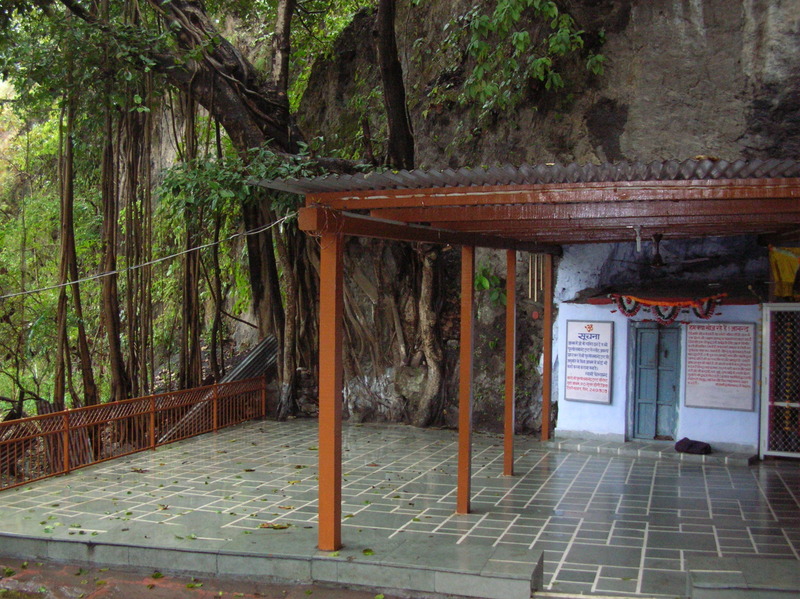 The second day we were there, we hired a driver to take us to Vashishtha’s Guha or Cave, reportedly the actual cave that this legendary sage lived in 9000 years ago. (Today, many yogis know him for the pose named in his honor.) Our teacher, Claudia, had put it on our “do not miss” list. We headed up the river for about 45 minutes of curving roads with switchbacks that offered beautiful views of the green Ganga weaving gently below us. Our driver, who spoke minimal English, eventually pulled over and headed down an unmarked trail on foot, passing cows on the narrow steep path, until we reached what appeared to be a small ashram. No one spoke English, and the place was devoid of tourists. We were instructed to remove our shoes at the patio and waved towards a door next to a huge banyan tree. It appeared that we were entering a building that was built into the side of the mountain, but beyond the door was a natural stone tunnel with candles lit at the far end. We stumbled towards them, questioning each other, “Is this it?” Moments later, our driver rushed in and said we had to hurry to catch the ferry across the river, so we laughed realizing that Vashishtha’s cave must be across the river. 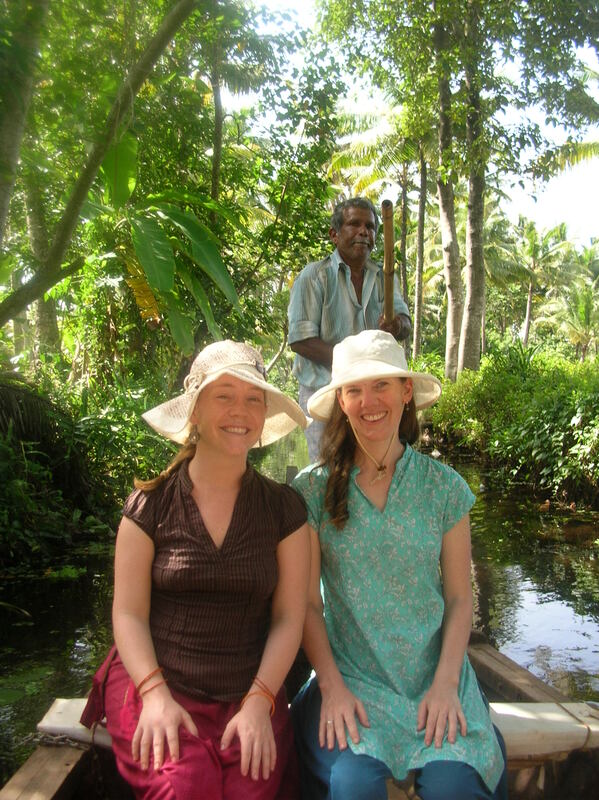 We caught the “ferry,” which turned out to be a big rowboat, and then took a short hike up the other side to another ashram. This one was very, very small and rural. 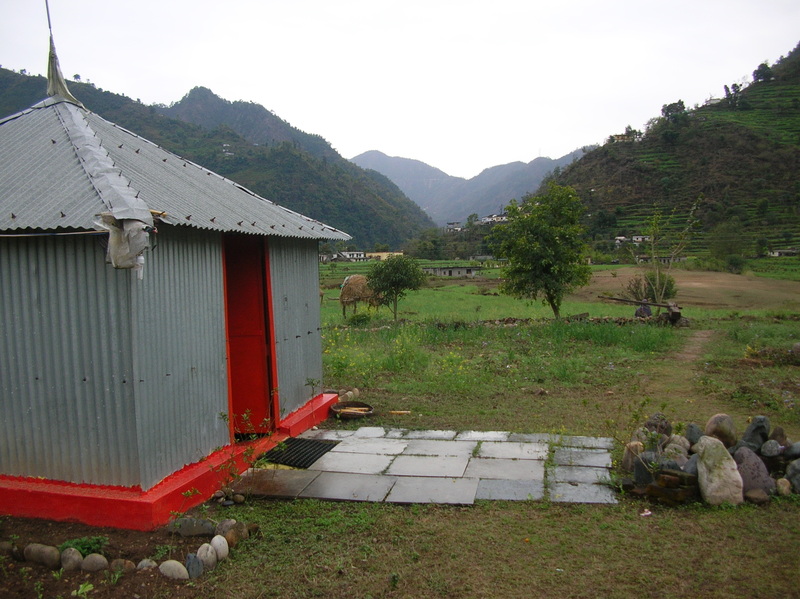 It had some lovely homegrown-feeling shrines, including one to Shiva that was housed in a tin shed. Our driver then took us to a restaurant for a late lunch, and as he turned the car back towards town, we started to wonder when we were going to get to the cave. After a belabored attempt to question him about its location, we finally realized that the small cave from the morning HAD been Vashishtha’s cave. We couldn’t believe we had blown right through it, after everything Claudia had told us about the amazing energy inside. Emily convinced the driver to take us back, regardless of the fact that the adjacent ashram was about to close, and we scrambled back down the path and sat for about 15 minutes in the cave. The silence felt ancient and heavy, and after our day of searching, we sunk into the quiet with enhanced reverence. 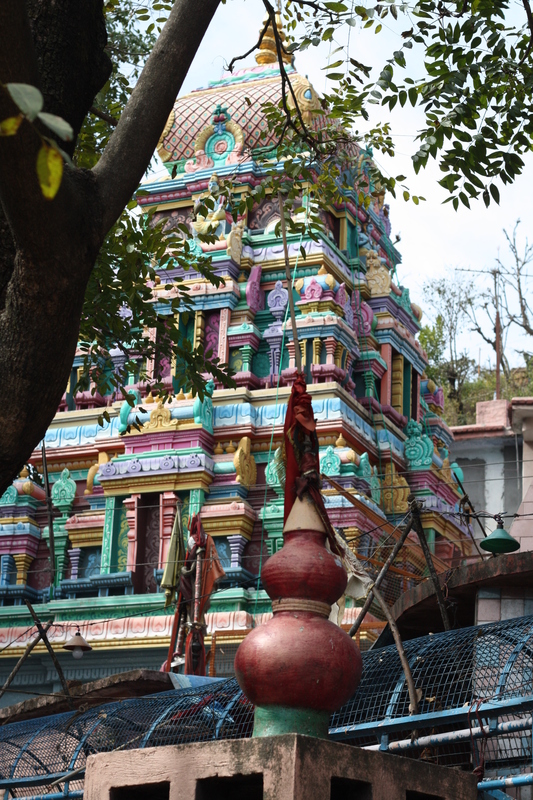 On a different day, we hired a guide to take us on a hike into the mountains above Rishikesh to the Neelkanth Mahadev Mandir, a Shiva temple. The hike was about 14 km, all up. There were many Indians taking this trail on a pilgrimage to the temple, and the atmosphere was celebratory. People were calling out as they traipsed up the path and other groups would respond. “Bum bum bolay!” echoed down the hillside, and as we caught on, we joined in which tickled the natives around us to no end. We encountered packs of curious, and at times demanding, monkeys and were grateful that our guide Prem brought monkey food to distract them away from our backpacks. For the last two miles, I chanted “Om namah Shivaya” to myself and prayed that Shiva would transform anything holding me back from wherever this path is taking me. Outside the temple, we bought flowers and water as gifts for Shiva, and then we stepped into the stream of worshipers as they flowed inside, carrying us with them. After pouring water on the shiva lingam at the entrance, and placing flowers at each murti, and giving a coconut to the priest, and receiving a tillak in the shape of Shiva’s trident on our forehead, we found ourselves outside again. After hiking all morning up hill and paying respect to Shiva, the day felt auspicious and uplifting, made moreso by the festive mood of the crowd. We’re getting more used to being a tourist attraction at the tourist attractions we visit. One time we came out of the ashram and found ourselves in a crowd of beautiful Indian women who appeared to be from out of town. We all smiled at each other appreciatively, and Emily started taking pictures of them and they started taking pictures of us. Everywhere it seems, people want to be in photographs with us – they will make hand motions to suggest being included in a photo with us, and then they will eagerly scramble to see themselves in the photo displayed in the camera’s monitor. My hiatus from technology, specifically the Internet, was revolutionary – I highly recommend it. Many of us have become addicted to the constant information flow without even noticing it, but the withdrawal symptoms make it clear it is an addiction as sure as any other. Try this (especially if you don’t think you’re addicted): make a commitment to a certain period of abstinence (say, 24 hours, or even 48) and watch your cravings for stimulation or information as they arise and disappear. Just watch (and don’t give in). After about four days, I didn’t even miss it, and the free time available to connect with the world around me was welcome. Spending a bit of time as a tourist was also welcome after a month of studying. However, Punarnava’s conference – ostensibly the reason for our sojourn – was truly inspiring and well worth its own blog post, so stay tuned…. In the meantime, consider lighting a candle or bringing a flower into your home today to honor mother nature in whatever manifestation you find her. Jai Ganga ma! 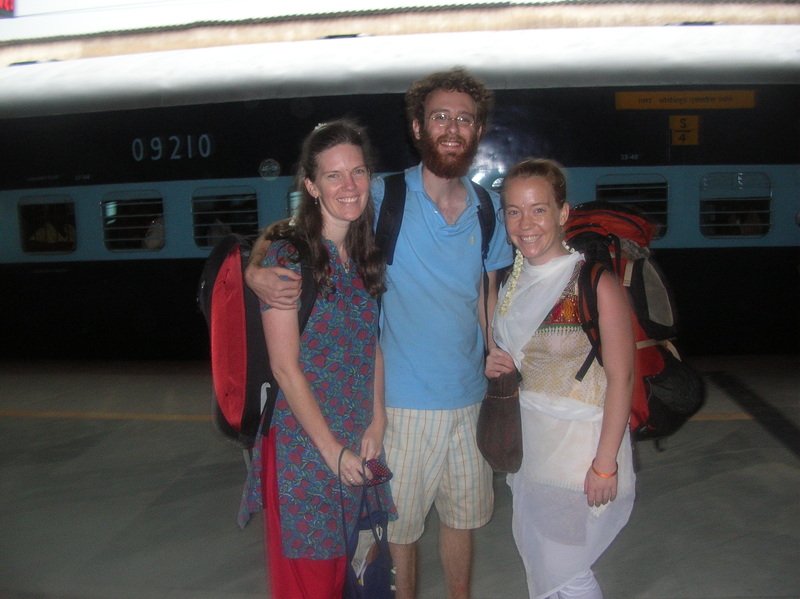 We’re going to Rishikesh! We just found out yesterday, and we fly out tomorrow – for ten enormous days. We are beset with laundry and packing pandemonium, interspersed with incredulous laughter and open-mouthed amazement at our good fortune. Some fairy godmother must be in charge around here. I mentioned in a recent post that Vaidyagrama’s parent organization is organizing a conference in Rishikesh next week, and here at the last minute they have bent over backwards to make it possible for us to join them. The conference is five days long, and we are going to arrive about three days early for some sightseeing and to help set up. We’ll get to participate in the conference sessions as well as help out behind the scenes as needed. As one of the doctors here put it, “It is a golden opportunity.” Dr. Ramdas will not be coming but has given us recommendations on which speakers to hear – “You’ll have to come back and explain it all to me,” he laughed. 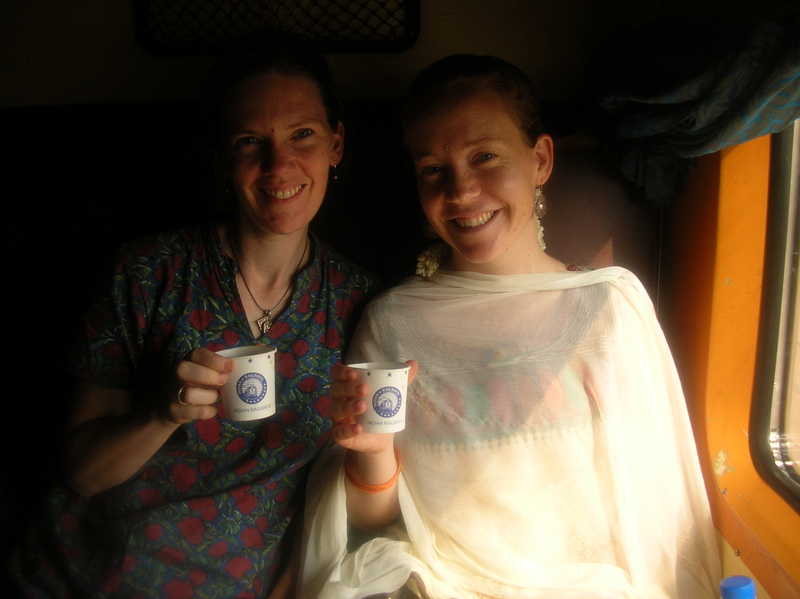 I had no expectation of getting to the north of India at all during these six months, and now, with hardly a moment’s notice we are off to dive into yet another community of Ayurvedic scholarship. There is an air of magic to it all. 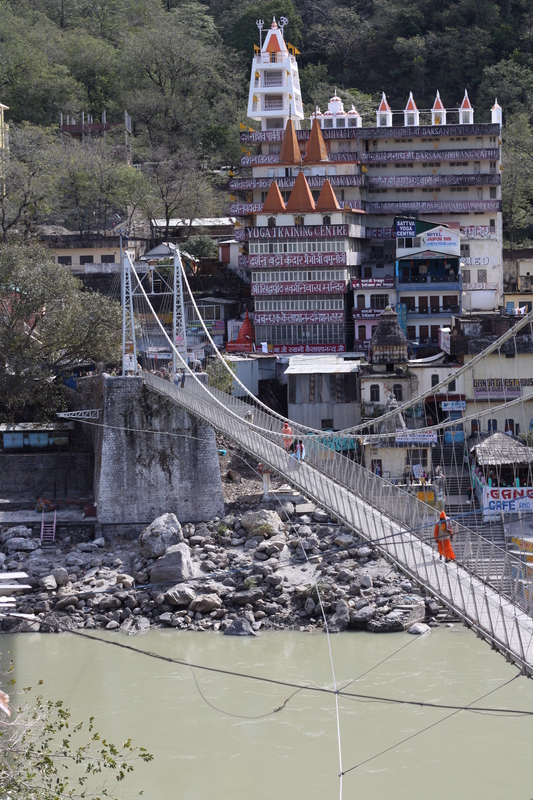 What I know about Rishikesh could fit in a thimble – or a blog post, as the case may be. 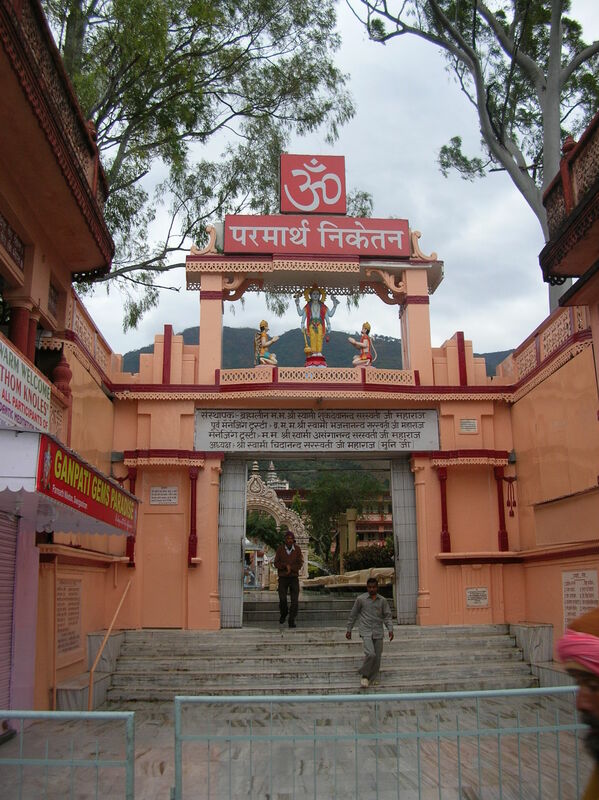 Located near the northern border of India in the foothills of the Himalayas, Rishikesh is home to a number of ashrams with deep spiritual roots and history, a mecca for yoga and meditation. Rishikesh itself is only about 1500 feet in elevation – not too high but enough to require a different wardrobe than we have acquired here in the south with our 90 degree afternoons. 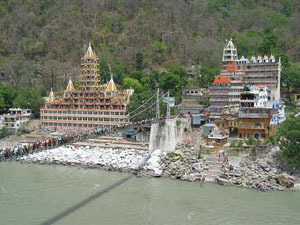 In Rishikesh, the highs will be in the 70s and it will get down to the 50s at night. We’ll need to make an early shopping excursion to purchase warmer clothes. 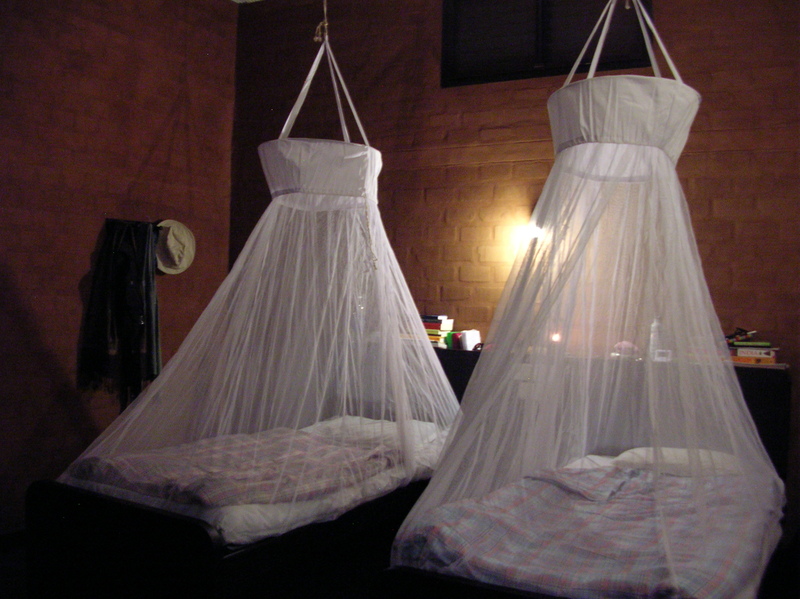 We will be staying at the Parmarth Niketan Ashram, which would be a tremendous experience in itself even if there wasn’t a pool of Ayurvedic inspiration swirling around us. The five day conference is jam-packed with lectures, yoga classes, and roundtable discussions, with about 350 attendees, mostly Indian students, scholars and practitioners. Aside from hearing Dr. Robert Svoboda’s last lecture before his retirement from public life, I am also looking forward to being with Mother Maya, previously known as Maya Tiwari. She has written several books on Ayurveda and women, a rare focus in this ancient science, and I am eager to feel her presence and hear what she has to share. Even with all of that, the most thrilling thing to me is that I will get to see the Ganges River. Such a central focus of Indian devotion, considered an actual goddess incarnate, I am eager to stand next to the mighty Ganga as she throws herself down from her source in the Himalayas, flowing right in front of the ashram. 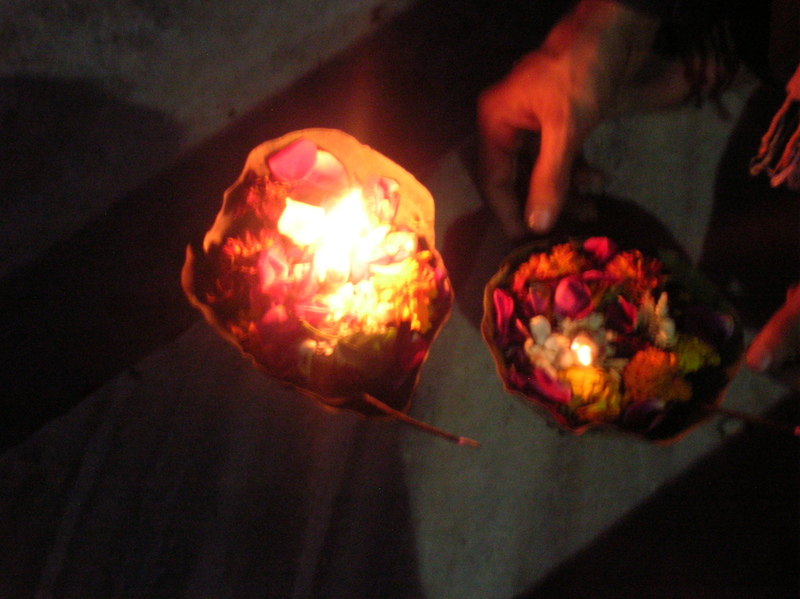 There are nightly aarti ceremonies in which candles are floated down the river, spreading the light. I can scarcely wait. I will not be taking my computer with me, so there will be silence from my direction for the next twelve days or so. 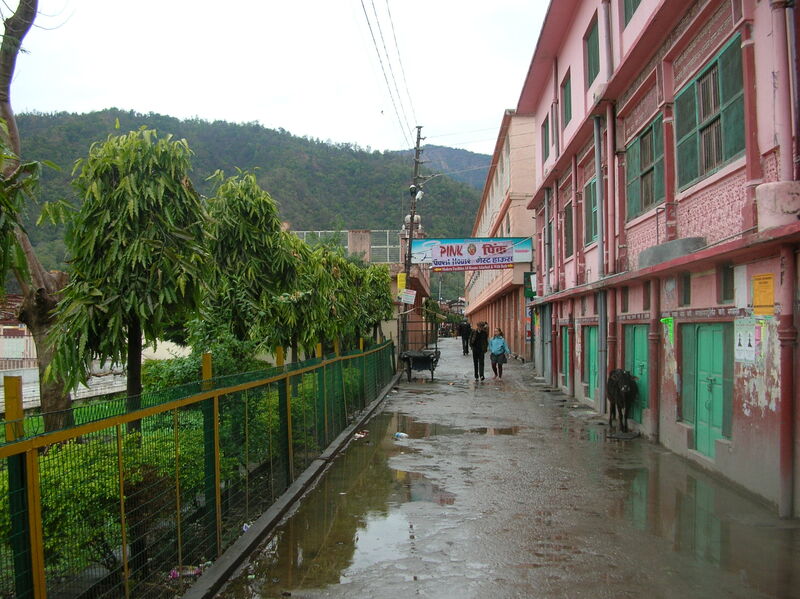 I have been ruminating on the effect of remaining tied to the internet while I am here – holding on to the familiar through email and websites – and have been wondering what it would be like to take yet a further step away in mental space, so this time in Rishikesh is an unexpected opportunity to take a technology sabbatical. I will write again once I am back and have had a chance to digest a bit. Here at Vaidyagrama, it was announced this morning that, in light of our eminent departure, tonight there will be a “cultural entertainment” party. All are invited – patients, students, and staff – and all are encouraged to perform in some way, such as singing a song that represents your home country’s culture. I plan to sing “Amazing Grace,” with thoughts of my late grandmother Naomi, as it was one of her favorite songs. The gathering will be a sweet send-off and an apt reflection of the grace that is so palpable here. Sometimes it’s too easy to forget it surrounds us all. Turns out I know even more people in this enormous, anonymous city than I thought. Sunday afternoon I took a taxi from Daniel’s apartment in to Mumbai proper, about a 45 minute drive south, to meet up with my friend Aditya’s parents. As my 18 month old niece Koruna says, I felt like a Big Girl, heading off by myself into this roiling mass of activity. Daniel had prepared me well for the taxi: “The meter is on the outside of the cab, on the passenger side, so the driver will reach over to the outside of the car to turn it on. When you get to your destination, the meter will say a number and the driver will hand you a card with a grid that shows all the numbers and the fares that match up so you can see the appropriate fare- unless it’s an electric meter, and then it will just say the fare. And there is no tipping.” Got it. Miraculously, I managed the taxi on my own and found the right flat. Aditya’s parents Rohini and Shekhar were waiting for me with lunch on the table – the most scrumptious meal of green pepper, onion and spices, peas and potatoes, and roti (thin bread cooked on the stove top), followed by rice and yogurt. Rohini explained the finer points of using your hands instead of utensils, a lesson well needed. After lunch, Shekhar took me to a very conveniently located tourist attraction – Mani Bhavan, the home of Mahatma Gandhi when he was in Bombay, is literally across the street from their flat. 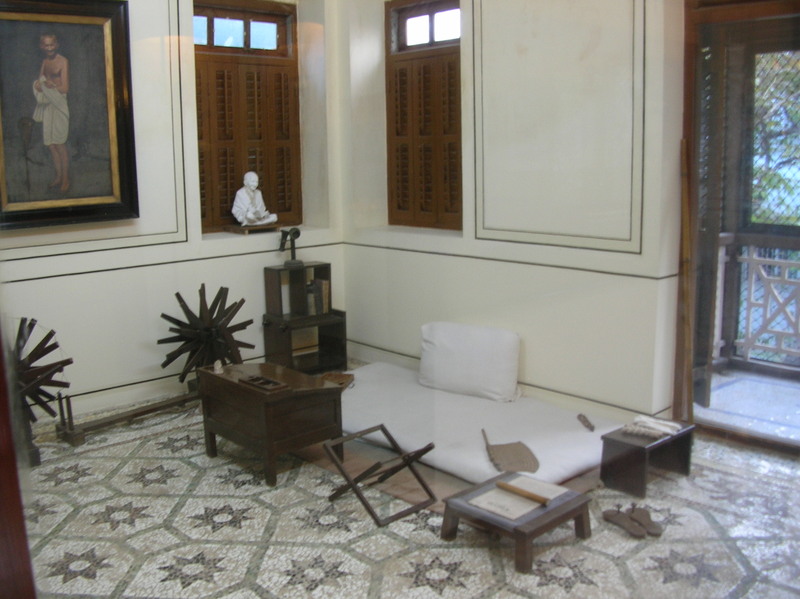 The three story house now holds a library, many historically significant letters and documents, and a sweet little display of figurines depicting important moments in Gandhi’s life. It felt right to pay homage to Gandhi during my first days in this country, and fortuitous that such a site emerged in my path without me even seeking it out. When we returned, Aditya’s brother’s wife Heetal had arrived. I liked her instantly. She took me with her to buy some candles a few blocks away. It is fun being someplace so different (and being in an open enough state) that a simple errand becomes an exciting field trip, an opportunity to simply see things around you. On our way back, we passed what looked like a nondescript office building with a small crowd at the entrance, and I could hear chanting inside. When I asked, Heetal said it was a temple. 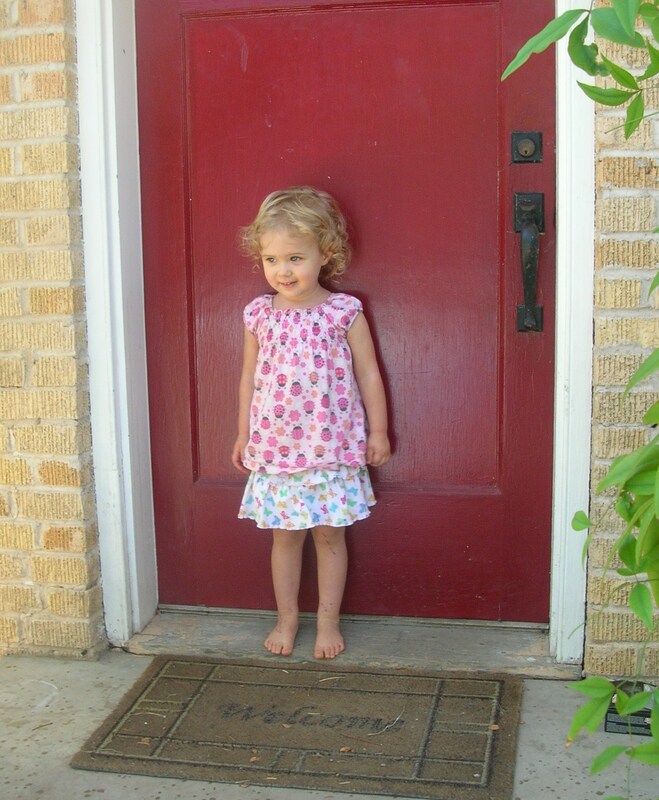 “Do you want to go in?” she asked. I hesitated, nervous about looking out of place, but realized this was only the first of many times that that feeling would arise in the coming weeks. “Absolutely,” I said. Inside, about 25 people were standing in a small room facing a murti (a sculpture of a deity) ensconced in glass in the middle. I stuck close to Heetal’s side as many pairs of eyes followed our movements. At the edge of the group, several women moved together to make room for us and waved us closer so we could view the murti more easily. It was a beautiful goddess, with flowing colors and flower garlands around her neck. I didn’t recognize which form of the goddess it was, and Heetal explained it was Ambe Ma, also known as Ambe Mata. We stayed several minutes, and when Heetal started moving towards the door an older gentleman brought us each a flower from the murti as a blessing from the goddess. That evening, Aditya’s parents had arranged a dinner party inviting Aditya’s cousin Sanjay, whom I had met at Aditya’s wedding, and a couple I used to know in Boston, Maya and Dunigan, who unbeknownst to me had relocated to Mumbai. Dunigan works at Bain as a consultant and Maya just gave birth to their second child three months ago. It was wonderful to see some familiar faces. We caught up over another delicious meal until my jet lag kicked in and my eyes started closing. 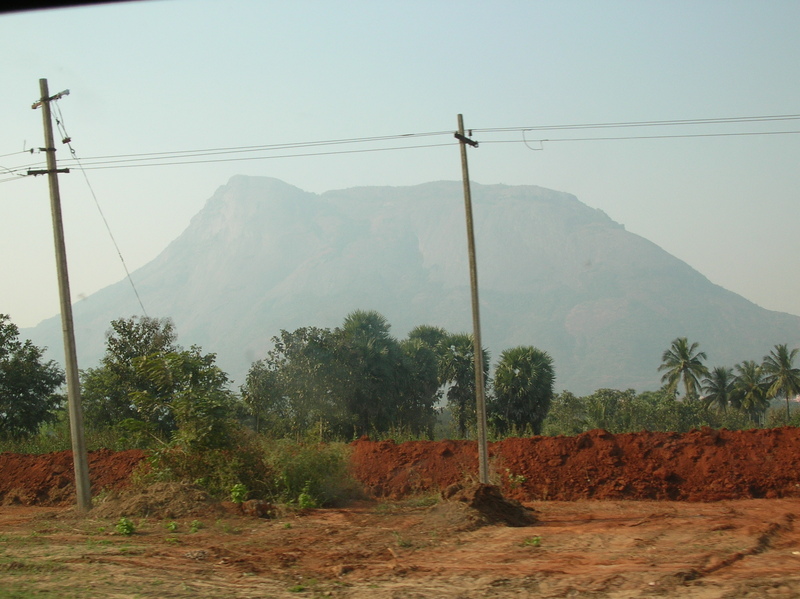 The next morning, Rohini planned to take me to several tourist sites, but their driver had not shown up. Neither Rohini nor Shekhar drive these days (a wise choice, I think, having now seen the Mumbai traffic), so they hire a driver who is on call for them during the workdays. Rohini called her brother and was able to borrow his driver for the morning, so we headed off to the Hanging Gardens, which overlook the Arabian Sea. Next, we drove down to the Gateway of India, a large Arc de Triomphe-style arch on the waterfront built by the British to commemorate the visit of King George V to India in 1911, the only visit of a reigning British monarch to India. Ironically, the last British troops to leave India in 1948 exited through the Gateway too. The Gateway of India is right next to the Taj Palace, the high end hotel where terrorists targeted tourists in the November 2008 bombing. We went into Victoria Terminus train station, drove past the Rajabai Clock Tower and drove down Fashion Street. In honor of my brother Ian’s visit back in 1999, of which Rohini happily recounted many stories, we went into an art gallery that she had sent Ian to. I am reminded how much energy it takes to simply take in sights, to observe, to feel the movement of countless bodies around you. It is no surprise, then, that with jet lag and visual overload, I thankfully fell into another nap that afternoon. Hopefully by now, I am finally caught up on lost sleep.